If you live in a climate which gets snow, then head out for a ride after the winter’s first snowfall! As long as there’s no ice beneath the snow, you can ride safely, but be sure to keep rides short to avoid overexerting your horse. February will be the perfect time to host a barn party for ANY reason or NO reason! Invite all of your barn friends and boarders, and ask everyone to bring a dish for a potluck meal. Have a treasure hunt or make Valentine’s for the horses. We’ve been lucky that many horse events are internet streaming their shows from around the world. Check out the USEF Network and see what’s coming up. From vets to high level riders to sports psychologists to feed manufacturers. There are plenty of experts around who would love to come to your barn to answer your questions. When the weather is just too harsh to ride in, you can continue to learn about riding and improve your skills from the comfort of your couch. Pick up a new riding or training book or DVD, take notes, and put what you’ve learned to work the next time you get to ride your horse! Work on both manes, tails and the forelock. Learn how to do the more traditional looks, then try something different like a French braid. The more you do it, the better and faster you’ll become. 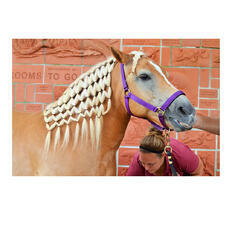 If you become really good you can earn extra money during show season by braiding other people’s horses! Many areas host horse expos this time of year with top trainers, demonstrations and vendors. You may have to drive an hour or so, but they are well worth the trip. Get together with your horse friends and schedule a wintertime photo shoot. You can have all sorts of fun with your horse and/or your friends. And you might just get that perfect shot for next year’s Christmas card! Try to find someone local who offers sleigh rides. A sleigh ride can make for a fun adventure, especially if you’ve never gone on one before. If you’re not able to ride during the winter, then make a point of working on groundwork with your horse. A good groundwork basis can build your relationship with your horse, and the respect that your horse gains through groundwork can later transfer to the saddle. What activities are on your winter horse bucket list this year? Drop a comment below and let us know! Stay Connected the Classic way. Receive weekly blog articles containing helpful tips, tricks, and facts related to all your equine needs.